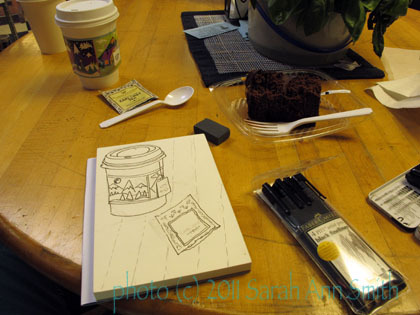 Art and Quilting in Camden and Hope » Blog Archive » Sketching on location: coffee cups! 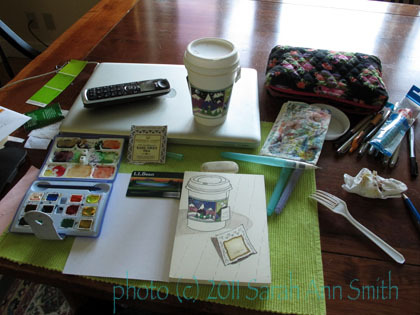 Sketching on location: coffee cups! OK…so I was actually (who me?) spontaneous this summer and signed up for a www.Joggles.com class with Jane LaFazio, Sketchbooks and Watercolor on Location. The idea is/was that you go OUT to sketch and sketch from the real thing, not a photo. I am SO GLAD I did…I’m having a ball, so much so that (as I’ve mentioned before) I signed up for a second class. This post is about the first class, and one of the early lessons. So I dropped the son off to run at the high school (this was late summer), and treated myself to tea and sweet at a nearby spot. Told the child I wanted /needed about an hour. 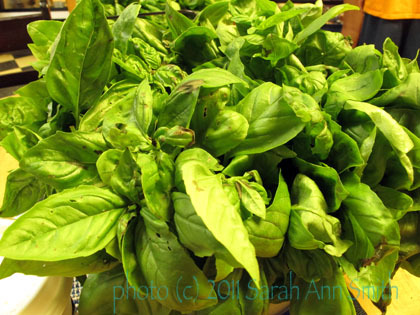 After dithering about what treat to get, I finally sat down at this table with LUSCIOUS basil. I briefly considered including the basil in the sketch. I then realized I'd be there 'til midnight if I tried, and decided (who me?) to go simple. OK, to go not as complicated. Then I finally began to sketch. 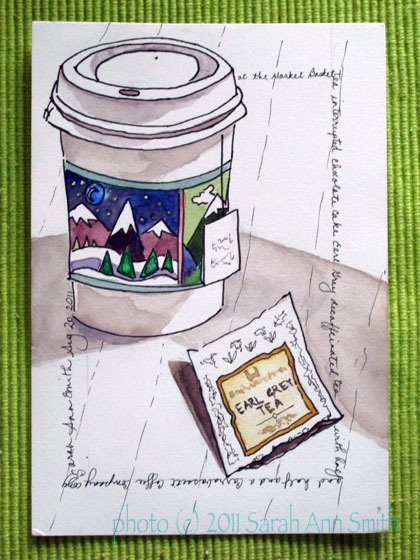 A close-up of the cup and tea bag. 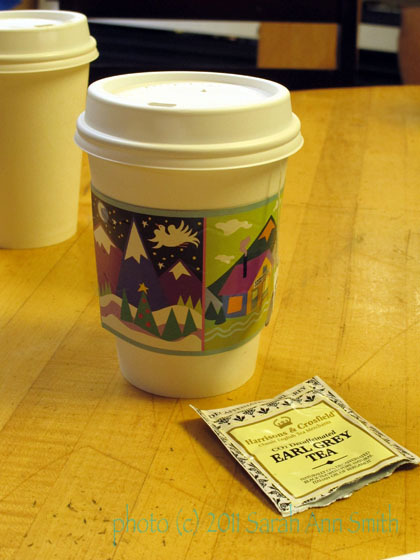 Don't you just LOVE the cup sleeve, from the Carrabassett Coffee company? Here is the sketch, done first in pencil, then inked in with a Pitt pen. Of course, 20 minutes after I arrived I get a call: “Mom, it’s too hot to run!” Me: “remember I said I needed about an hour?” Then, “you’ll have to wait for me for another half hour…find a shady spot to sit.” Sigh. Inked in....cup is too short and not tapered enough, but still OK.
SO…. 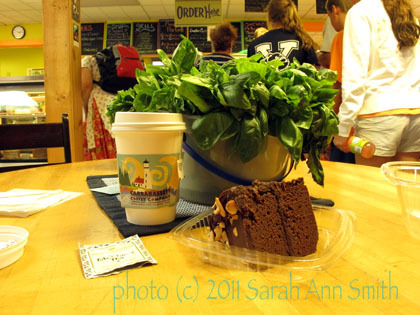 I packed up my cup and supplies and the rest of the chocolate cake (slurp), and retrieved the child and headed home. It actually was pretty warm. Then I set things up at home. The shadows/light were different, but close enough…. Adding color at home, on the dining table, lacking the usual clutter around my spot. Considering I’m just starting with watercolor, I’m pretty happy. I have discovered that having REAL watercolor paper makes a world of difference, and having little water in the brush makes it much easier to stay within the shapes and not bleed and make yucky stuff! FUN! This entry was posted on Friday, November 4th, 2011 at 3:40 am	and is filed under Art, Classes I've taken, Drawing, Paint. You can follow any responses to this entry through the RSS 2.0 feed. Both comments and pings are currently closed. Not a bad sketch for a beginner. Not really a beginner? That cake also looked tasty! Dorothy. I think you did a fantastic job- keep it up you will be amazed looking back through your sketch book- how you improve- real is so much better than photos! I think it turned out great Sarah! I love it! I just tried my hand at watercolor yesterday for the first time. I love what I did too but it wasn’t a drawing. If I have time, I’ll post it on my blog but I’m headed to Houston in the next hour or two, and I have some other things to do. Have a wonderful weekend. Your work doesn’t look like a beginner’s to me. Looking forward to seeing your next work.